It’s been a week filled with visiting with folks in real life (IRL) around here. My BFF came over for a visit and to see my new place. Our families lived next door to each other in Nashville for over 20 years. We’re about a 1.5 hours from each other now, so it’s a real treat to visit in person. I also had dinner Thursday with new friends in a lifestyle MeetUp group that fits me well. And, I noticed there are a lot of work-from-home folks posting in my ‘hood’s Facebook group, so I asked if there were any bloggers here. We had our first meetup in the nice coffeehouse down the street on Saturday morning. We’ll do it again after the holidays. I hope to expand that group to an official MeetUp that is city-wide. It’s a real pain to drive to Nashville for such meetings. And we can keep it more diverse than just WordPress related too, as we have all kinds here. So yes, I’m finally putting down roots here in Clarksville, since I’ll obviously be staying for a while. And it’s so good to meet new folks and get out of the office regularly too. There was a nice referral for me on the Platform University FB group and I want to thank Laura Sanders for that. She sent a new online business owner to me for my Scratch to Published 1-on-1 class. I’m getting more and more folks under 40 for that class, and for every class I offer because they seem to have a more sensitive BS meter and hate the kind of hype they find in other programs. Plus, they are willing to invest in their education first and try new things so they can get a foothold in otherwise saturated niches. For all of you who are more established, you better start opening your minds to new ways of doing things or you’ll lose your audience to these up-and-comers. They’ve got great ideas and a fresh take on things and they are hustling!!! Part of that Scratch to Published class included my whole library of WP tutorial basics. But, I shut that down a couple of years ago and have no intention of bringing it back. Nor do I intend on having a standing course for Gutenberg. I may do a blitz class on it, and have the replay for a limited time, but it’s changing too fast for me to create a permanent course. That’s the whole reason I shut down the other one. I was losing my shirt trying to keep everything updated for the price folks were willing to pay. You need thousands of folks in the course to make that profitable, or to even break even with it. So, I’m vetting WP basic courses offered by others this week. There is one that is taught by Morten Hendriksen that I’m really looking forward to checking out. He’s the guy that did the Friday keynote at WordCamp US last year that really opened my eyes to why Gutenberg is the future. And I’ll be watching his session at WCUS later this week too. And I’ve heard he has some Gutenberg tutorials in that class as well. So, I’ll be keeping an eye on those too. WCUS is this weekend. As I mentioned in last week’s Tips Tuesday, even though it’s in Nashville, it’s just a little out of my budget to attend. So, I’ve already gotten my free ticket to the livestreams and blocked out my calendar for the sessions across Friday and Saturday that I want to watch. Webmasters – I strongly encourage you to check out the session list, as there are a lot of Gutenberg and dev listings for you too. We have to stay even further ahead than we keep our clients and this is a good way to do that. The Black Friday / Cyber Monday hosting deals are over, but you can still get in on the holiday discounts for my DIY SEO course, Webmaster Training, and site audits. Last week in the DIY SEO course we finished up our Live Labs on the new Google Search Console interface. Replays will remain available. And this week we begin the Jumpstart Challenge for our critical Yoast settings and Google connections. Those will be little 5 minute checks that are emailed every few days. They will help ensure you have the critical foundation settings correct before we start the live Workshops in January. That’s important because the first one is for Technical SEO. We check if Google can properly crawl your site, and any issues it is having. Plus, I will have all new recommendations for our robots.txt files and more. So, now is a great time to get in the course!! Matt Mullenweg, the co-founder of WordPress and the lead dev on WP 5.0, has set up a FAQs page about Gutenberg and the release of 5.0. We are currently on the Release Candidate 2. That means they think they have all the bugs worked out and are doing the final testing. We have no dates on when the final release will hit. And be sure to see the last paragraph. It speaks to just how much this thing will be changing after the release. Just because we don’t have a release date for WP 5.0 yet doesn’t mean there is nothing for you to do. Be sure you read my post on the steps you need to take prior to WP 5.0 even rolling out and get them done now. And then there’s a few things for you to do the week of. We’ve got a big problem that I’m investigating and one that made me think I was losing my mind for a while. I saw this issue with both Yoast SEO and Genesis. I’m not picking on them that’s just where I saw the bigger issue first. I had purposely waited to do the recent major updates on both. When the next point release came out, I felt it was safe to do the updates. When I logged into my sites, I was upset to find that those minor releases had already happened. Okay, let’s get clear on all this lingo. A major release is when we go from version 2.6 to 2.7. Normally, if you don’t do an update on a major release, like version 2.6 to 2.7, then the minor updates that follow, like 2.7.1 won’t auto update either. But they are doing just that. This is going to be a serious problem when WP 5.0 rolls out. I haven’t seen any issues with the minor plugin updates so far. But, if the minor WP updates come through too, we’ve got a big issue. But the big deal is, the update system is not working as it should. If you haven’t upgraded to the major release, the minor ones should not come through either. Right now I’ve hard coded WP updates to be off on my sites. And, I’ve advised clients to use the Easy Updates Manager plugin to do the same. I may need to update those settings to turn off all updates of every kind. The caveat with that, and what I mention in that post, is we need minor updates for security fixes. That’s the whole beauty of leaving auto updates for minor releases on. So, if we turn all that off, we could introduce a security risk on our site. It means that we have to be hyper vigilant to watch for updates and read what they are more than ever. With everybody being so busy with the holiday season right now, this concerns me greatly. Like I said, I’m checking into it. Please report if you are seeing the same thing with auto updates on point releases, even if you haven’t done the major release update. I’ll have recommendations for you as soon as I can. A few of my clients are on reseller accounts at A2, and I didn’t cover the unique way you have to update PHP levels on that type of hosting. So, I added screenshots and instructions above the video tutorial. So, go see that if you have a WHM (reseller) account. Hristo from SiteGround just announced that they have done a major overhaul on their SG Optimizer plugin. It includes a lot more caching that is specifically designed to work with the way they have their hosting set up. And honestly, it’s a little odd compared to other hosts, but it works great. I think this development is very interesting, considering that earlier this year SiteGround worked closely with the nice folks at WP Rocket so that plugin would work well on SiteGround and their odd setup. And now SiteGround turns around and does their own thing – including several new features that are like the best of the WP Rocket plugin functionality. Welcome to Open Source coding!!! Anybody can “borrow” any code from any plugin that has an Open Source license and fork it by tweaking a little and then calling it their own. I’ve got a test site over on SiteGround, mainly for speed tests like this, and I’ll be putting those new speed settings through their paces. But, I’m going to wait just a bit. Within hours of Hristo’s announcement, bug reports started coming in and the point version has been updated 3 times already. And FYI, historically I’ve been able to make sites faster by turning off the SG Optimizer plugin and doing the speed tweaks another way, including using local caching plugins like WP Fastest Cache and WP Rocket. So, we’ll see if this has the same level of intelligent caching as those plugins do or not, and if it actually works well. I can already see folks not knowing this stuff is turned on or what it does, and then adding a caching plugin which will set up conflicts. SiteGround has installed a checker for such things, but I don’t know if it periodically checks or whether it only checks when you first install the SG Optimizer plugin. We’ll see. It will be no earlier than January before I can start running those tests. Hey Webmasters, this is a pretty technical post about the issues the HTTP/2 protocol causes, especially with progressive jpegs. It infers that HTTP/3 will fix these issues, but that will be at least a year or so down the road. I’ll be doing new speed tests next month and adding deeper image optimization testing too, so I’ll be looking into how different programs save jpegs and see if that matters. This would scare the pants off of you! A Google algorithm glitch suspected Search Engine Land of being hacked and deindexed it. The site was not hacked and the issue is being fixed, so don’t freak out if this happens to you!!! Are you a foodie blogger? Then this interview on the SEMRush site with Casey Markee is a must read! Less ads equals more traffic. I could not agree more!!!! In fact, I have clients that can prove less ads = more money. And for the content, if you’re just writing filler about how much your hubby or kids love this recipe, or something about your life or dog that has nothing to do with anything, or showing 10 images of the same thing, then readers and Google are going to hate you. Show pictures of the process, not multiple pictures of the finished product. The foodie niche is one of THE most competitive and saturated. You MUST start thinking about UX – User Experience, else you are not going to build tribe, get repeat viewers, or make as much money as you could. My clients are the proof in the pudding about this. Pun intended. 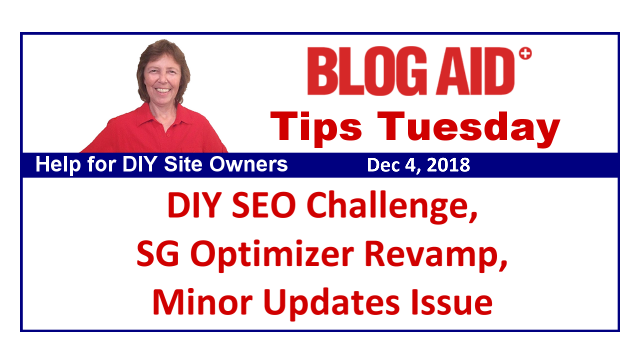 READ: Best Recipe Plugin for SEO Including Schema Markup and Speed and look for the link in there to a sister post from Marilyn Lesniak on plugin functions. Thank you for your advice on SG Optimizer. I updated the plugin yesterday and then got the message about the conflict with WP Fastest Cache. I just deactivated SG Optimizer, so glad I have you for guidance. Debra, I would not advise deactivating that plugin if you were already using it. You may have had other functionality turned on that you need. It would be better to go into the plugin and turn off the caching options that are conflicting until you can investigate all else that you may have been using that your site depends on. Interesting and scary that the updates seem to have a mind of their own. I’ll be keeping a close eye as you continue to report on the issue. Thanks for another great post!